Life always comes to a head before the fall shoot. There are piles of things to wrap up and it feels like an impossibility that everything in need of getting done before I leave for the shoot will actually get done. But it gets done, somehow. Jeremy is stocked with meals to last him 2-3 weeks and I’ve got my own meals prepped or planned. I finished all of my shoots, cleaned and stored ALL of the huckleberries in the chest freezer, and squared away financial records. 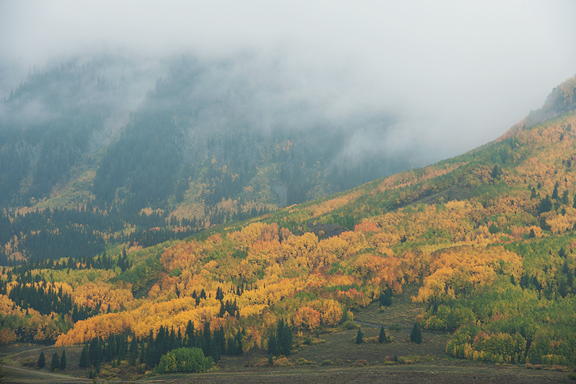 The drive to Crested Butte was quick with one stop to shoot some colors for reference. 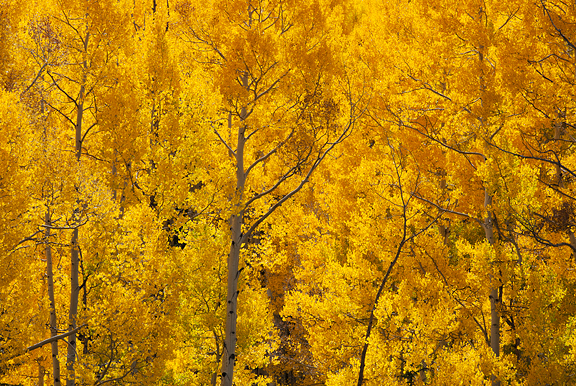 I took mental notes on the state of the aspens for the length of the 200-mile route to send my photog pal the color report. 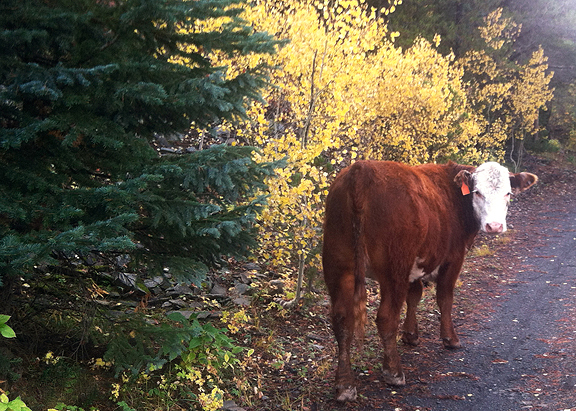 Once here, it was as if I had slammed on the brakes and life came to a halt. I like this shift in gears. I spend a lot of time alone with the trees and the trails and the road – thinking about weather, colors, mountains, trees, sky, light. Right now, I’m in scouting mode, but there is a calm that settles over me when I’m scrambling up a slope or gaining a ridge to check out the view’s potential. I’m all in my head, thinking to myself, talking to myself. 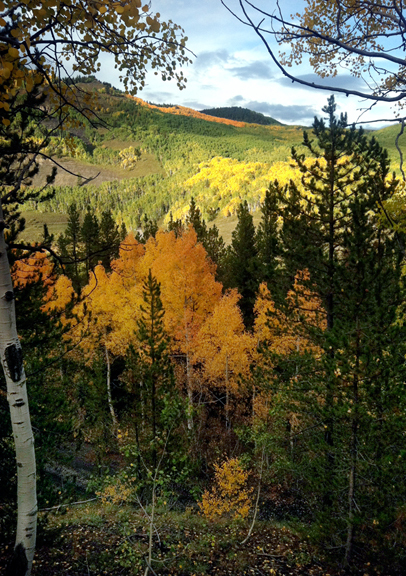 The colors are building, though still this side of peak colors. 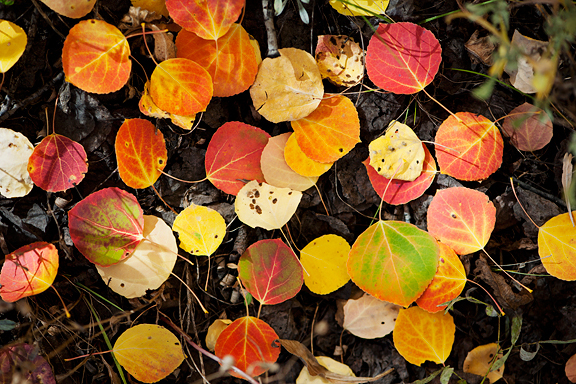 Lots of greens juxtaposed with big splashes of vibrant golds, oranges, and reds – the color of fire. It’s been warm and sunny, until this morning when I woke to hear rain tapping away at our metal roof. Overcast and foggy, I’m fine with shooting. Drizzle, that’s tolerable. Steady rain, not so much. The temperature hung at 48°F for much of the day while I worked on the computer. The forecast was for two days of rain, but by afternoon the weather broke and we had blue skies, puffy clouds, and sunshine. I gave it a few hours (to let the trails firm up) and then grabbed my trail runners for a much needed run. You have to grab the opportunity when it comes! 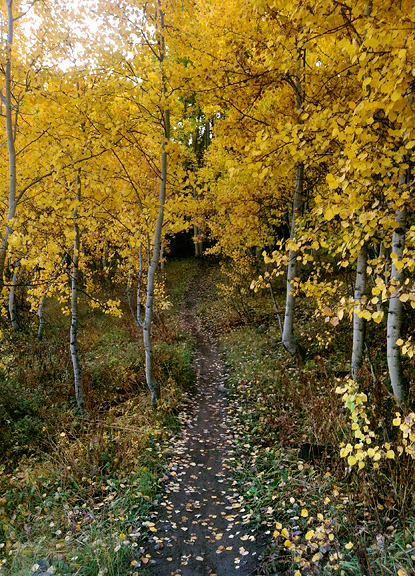 This doubled as a trail run and scouting run to see what the leaves are up to. 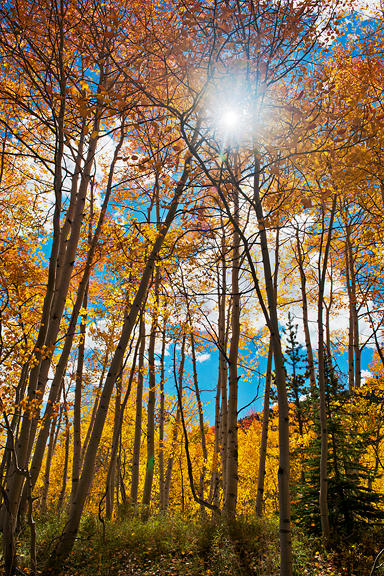 A couple of days of rain is nothing to worry about as the weather should bounce back to Colorado sunshine. The leaves are fine and doing their thing. There may be some snow getting thrown into the mix this coming weekend, which makes things very exciting for both the photographer and the skier in me! But any cool down at the tail end of summer is an excuse to make soup in my book. In my efforts to clean out the refrigerator before hitting the road, I wanted to use up the last few ears of local corn… some sort of corn chowder? 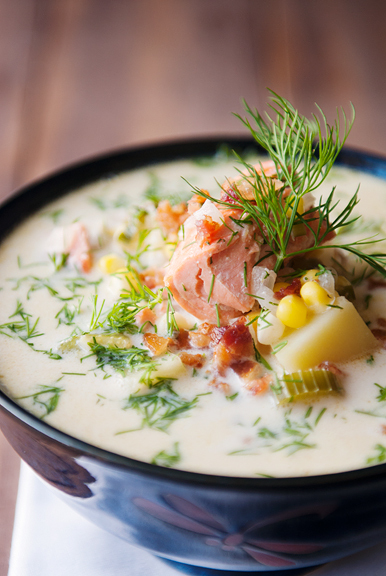 Perhaps a salmon corn chowder? 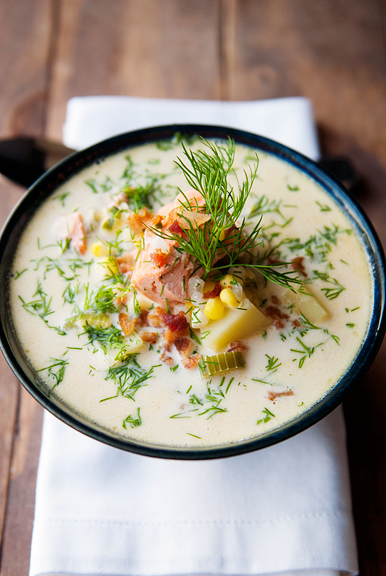 Yes, salmon corn chowder. 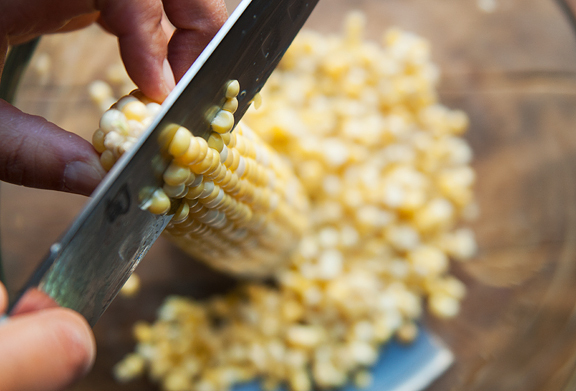 I love seafood chowders and I love corn. Better than that, Jeremy loves seafood chowders and corn. The last time I made lobster corn chowder was for Jeremy’s 40th birthday party, which was cancelled because of the massive floods. No one could get to our house because the roads were washed away, so Jeremy not only got lobster corn chowder for his birthday, but he had it all week long (and loved every last spoonful). That chowder takes some effort, but THIS chowder is far far easier and faster to make. If you have fish stock on hand, use that. I almost never have fish stock, so I opted for chicken broth and the chowder turned out beautifully. 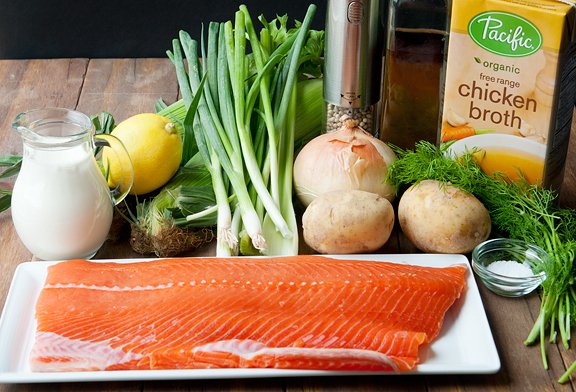 The salmon in this set of photos is wild coho salmon which has fantastic color, flavor, and texture. While the original recipe called for red potatoes, I opted for yukon golds because that’s what I do. However, despite my thinking that it was too much trouble to take the black peppercorns out of the grinder and put the white peppercorns in, I went ahead and did it and used white pepper per the recipe instructions. I’m so glad I did because the flavor is fantastic. So do that, even if you have to use pre-ground white pepper. 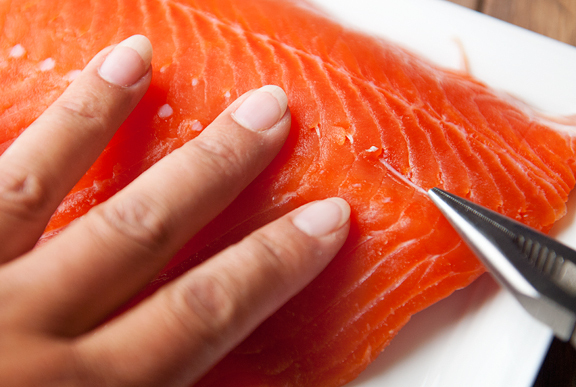 One other thing I would change – the original recipe lists two pounds of salmon. That’s what I did. 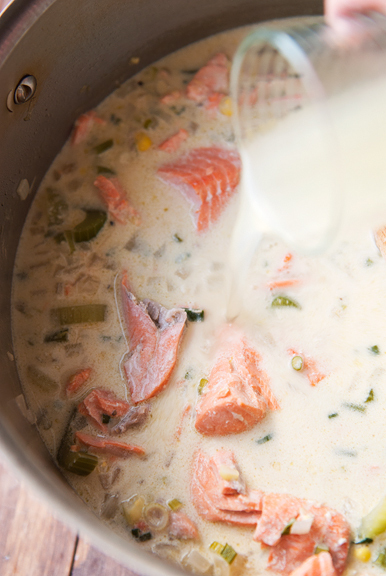 But I found there to be so much salmon in the chowder that I barely had enough soup! I complained about this to Jeremy, because I really like soup and I really like vegetables. 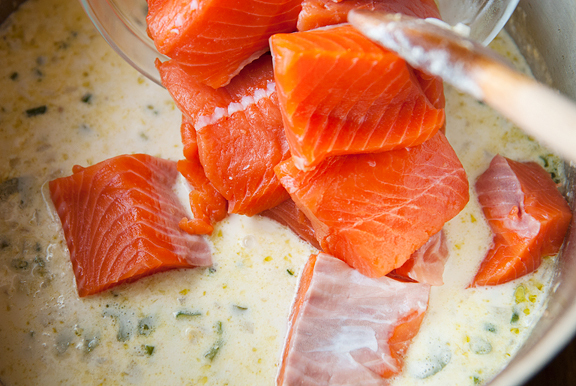 He paused before shoveling another spoonful of chowder into his pie hole and said, “I like it.” So if you like super chunky chowder chock-full-of-salmon, then go for the two pounds. 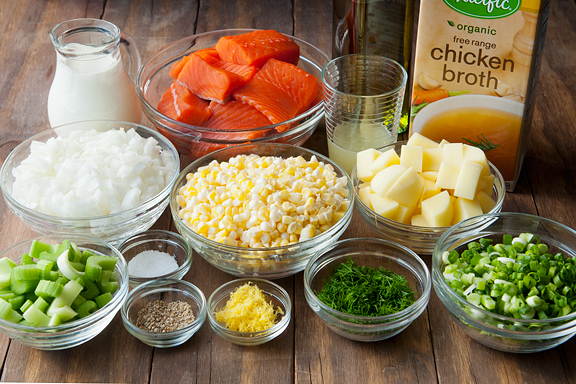 If you, like me, prefer to have actual soup and more vegetable than protein, then reduce it to one pound of salmon (or double everything else, right?). The whole recipe comes together on the stove in just over a half hour (assuming you have everything prepped). 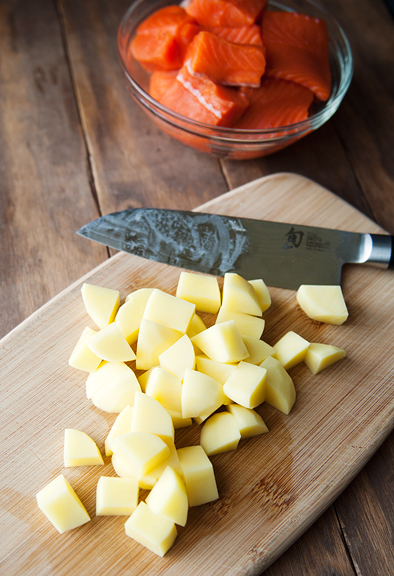 As the salmon cooks in the soup (which takes a couple of minutes), it will flake apart as you stir and break into manageable bite-size pieces. 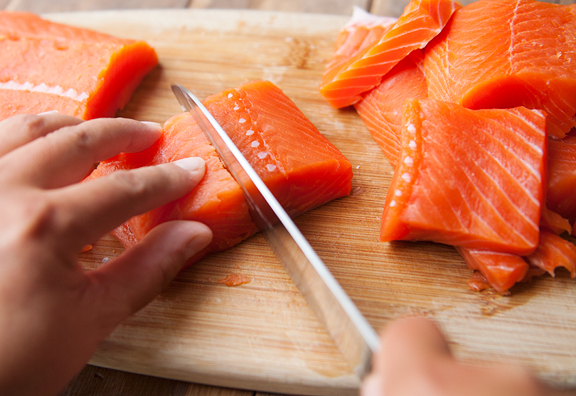 So don’t mash it up into a paste, but definitely give it a few pokes with a spoon to break up the large hunks of salmon. 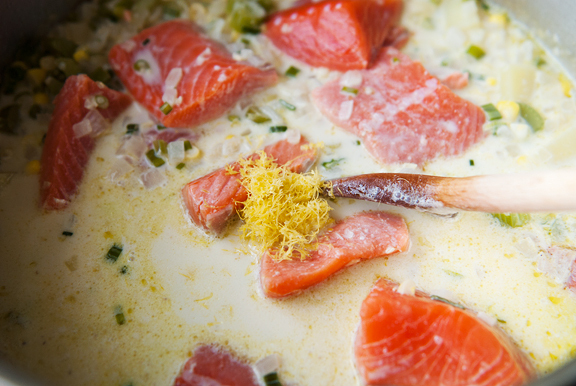 We absolutely loved this chowder (despite my issues with “too much salmon”) for the bright lemony zest and juice, the almost funky white pepper, and those comforting vegetables. Don’t forget to top it with fresh dill before serving for a nice green herbal hit. 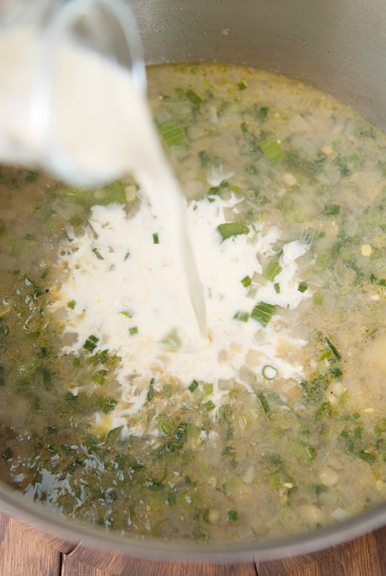 It all works so well together and the chowder is sure to take the chill off of any cold day. In a large stock pot, heat the olive oil over medium heat. Sauté the onion in the oil for 3 minutes until soft. Add the celery and sauté for about 3 minutes. Stir in the potatoes, salt, and white pepper. Cook for 5 minutes stirring every minute or so. 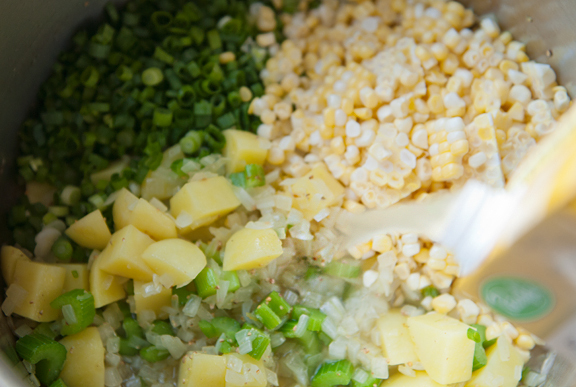 Add the green onions, corn, and 2 cups of the stock. Bring the liquid to a boil, then reduce to a simmer and cover. Let cook for 15 minutes until the potatoes are almost tender. Add the cream and simmer uncovered for 5-7 minutes. Stir in the salmon and lemon zest and more stock as needed (I added the remaining 2 cups). 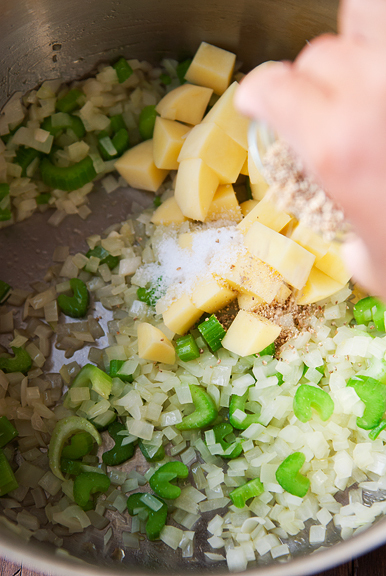 Simmer the chowder for 3-4 minutes. Don’t worry about the giant hunks of fish, they will flake apart into manageable sizes when the fish cooks. Stir in lemon juice to taste (I used it all). Adjust the salt and white pepper to taste. Top with fresh dill before serving. Serves 6-8. I always like soup, any kind, and I love salmon. This will be a nice winter treat with a few pieces of french bread. 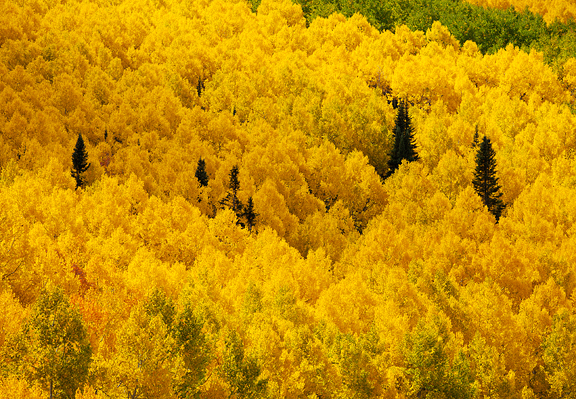 Your aspen images are breathtaking and the chowder sounds (and looks) absolutely delicious. Thanks for sharing both! Once again, beautiful photos! Thank you for sharing your travels. CB is looking wonderful. It always amazes me that different places truly do exist at different paces – I ran into this like a brick wall (except a brick wall I really love) when I visited home in MT a week ago. 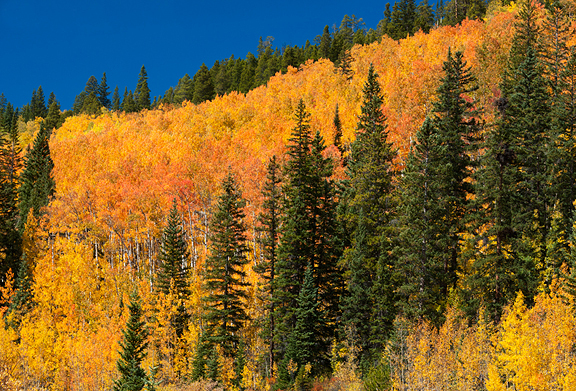 Enjoyed beautiful aspen colors by Twin Lakes this weekend – hope you get the same amazing colors and more! Love the color shots! And the chowder looks great. I am with you on the more soup & veggies. My son loves Italian sausage & kale soup, so I sit next to him & shove my excess of sausage into his bowl. Yum that looks amazing and warming! I imagine that it comes together quickly, too. I’ll be making this soon!! One question for you regarding your knife. I’m in the market for a new santoku but I’m left-handed. What type of knife do you have and do you know if the handle is shaped specifically for right-handers? I heard that some Shun knives are but some are not. I made this chowder tonight and it was lovely! A perfect late summer meal, easy enough for a weeknight, and the lemon really made it stand out. Definitely a new dish for our main rotation. (BTW, I also have a bucket of pizza dough parked in my fridge and have made many delicious combinations.) Thank you so much for sharing! Looks yummy. I’m going to forward the recipe to my sister, on Martha’s Vineyard for the month,….maybe she’ll try with lobster! This looks so so yummy, i definitely have to make it this weekend, I can’t wait to try it. does this save for leftovers? Or is it a one night meal? Did this chowdah tonight as some dissertation therapy. I added onion and garlic to the celery for the initial sautee. I wish I had used like two slices of bacon for the fat instead of the olive oil…I think it would have added a little bit more layer to the soup. It was delicious though. Next time I’ll garnish with crisped salmon skin. Amanda – you’re so welcome! Twila – it’s true. 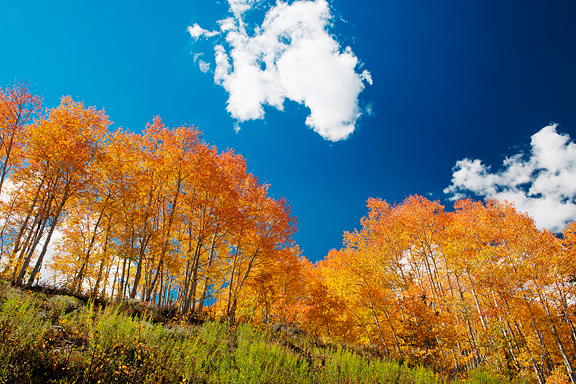 If you timed it just right, you could chase the colors for months around the country. steph – Sorry for the late reply! I have a Shun and I believe they make right or left handed handles for some models. Just go and ask when you purchase at the store. I really love these knives (I have the paring, santoku, and bread). darla – yay! I’m so happy to hear you liked it too! SweetSourSavory – hope it worked out for you! Jess – yes, it saves brilliantly as leftovers! Monica – it’s great with bacon as garnish too. I’ve already made this twice since you posted. SO GOOD. The first time, I used smoked salmon and just stirred it in right at the end. The second time when I used fresh salmon, I entered it into a chowder competition at work and took first place! All the credit to you! :D It’s so bright and really quite light for a chowder. One thing that I think really helped this was a great homemade chicken stock, gave it lots of depth. Thanks so much! Made it last night for my wife and kids, both of them loved it. To my amazement we already had everything we needed in the house to make this except for fresh lemons and dill. I just used the bottle of lemon juice we keep in the fridge and skipped the dill. Turned out perfect. Thanks for sharing.